It’s getting cooler and darker here so I pulled out the unglazed tagine and improvised a highly unauthentic (i.e., non-Mediterranean) tagine of chicken with habaneros, cayenne peppers and olives. I’d say it was a pretty unqualified success – I wish I’d had better olives and only added them at the end. And I think pimentón de la vera would have added a nice smokiness in place of, or in addition to, the sweet paprika. The interesting part is that the final result was not that spicy, even though that habanero packs a punch (and was supplemented by the other chiles) – the essential sour fruitiness of the habanero was there, but much of the sharp capsicum impact had dissipated somehow. Next time I’ll use more. 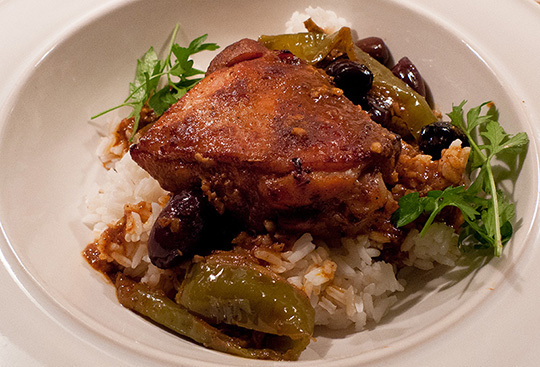 Final point – it is remarkable how the unglazed tagine adds a flavor of its own. Of course this is the whole point of unglazed tagines – the seasoning – but I wonder whether sometimes I want the slow-cooking properties of earthenware without that particular flavor (which I can’t quite pinpoint – some combination of the clay and all the dishes that have cooked in it previously). An excuse to buy a glazed tagine.